Cup anemometers measure wind speed in a highly accurate way. We’ve gathered together all the information you need to know about cup anemometers, how they work, where to buy them and more. Skip down directly to our sections below: What is a cup anemometer How does a cup anemometer work? and factors to consider when purchasing an anemometer. 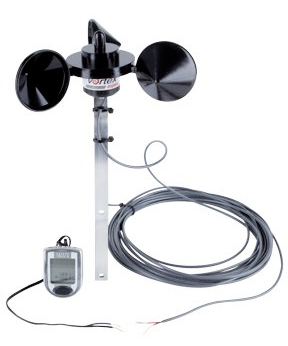 This is a popular wind cup anemometer which mounts to anything metal with its dual powerful magnet mounts on its base. It comes with a 25 foot long cable and a digital meter which allows you to measure the wind speed on its included display. Inspeed, the company that makes it, has designed this wind cup anemometer with the magnetic base so you can mount it on your vehicle for storm-chasing but of course you could also mount it at home on a sheet metal roof or anywhere else you have a metal surface to stick it to. For storm chasers or storm spotting in particular though, this is definitely one of the best cup anemometers out there because of its generous cable length allowing you to measure wind speed without getting out of your car (especially if its raining). If you’re looking for a wind cup anemometer but you want to mount it permanently or semi-permanently in a spot where a magnet like the car magnet anemometer above won’t work, this pole mount anemometer might be your best bet. Inspeed’s anemometers are quite accurate, up to + or – 1 mile per hour and the included display captures both the maximum speed reached in a session as well as the current average. The battery in the remote display unit lasts for months of continuous use. 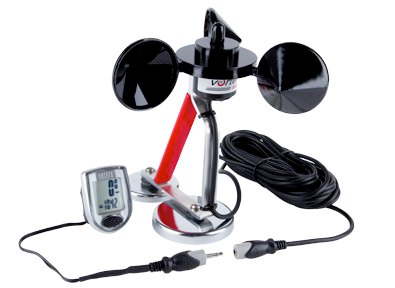 This wind cup anemometer comes with a digital display and a 25 foot cable, though you can attach your own 18 gauge speaker wire for a 100+ foot range which makes it easy to mount this anemometer on the roof of an RV or the roof of a house while the display is safely indoors. You can also bury the cable underground as well. 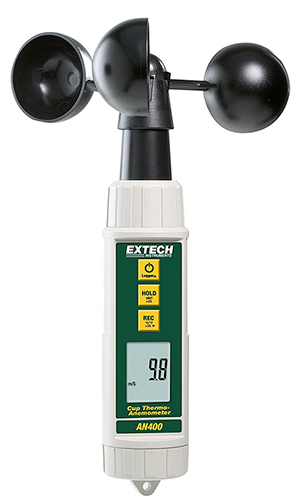 This Extech cup thermo-anemometer is a great portable wind cup speed meter that you can hold easily in your hand to measure the speed and temperature of wind anywhere you go. The built in thermometer measures temperatures in both Fahrenheit and Celsius. It features three rotating wind cups and can measure air velocity in meters per second, ft per minute, kilometers per hour and knots on its LCD screen. It can also record minimum and maximum values in its log, as well as the current airspeed. The housing is water resistant and it comes with 4 AAA batteries. It also has a loop at the bottom so you can attach a non-included hand strap if you’re worried about dropping it (or using it in particularly high speed winds or poor weather). If you need a wind cup anemometer but you also want to measure other types of weather data as well, then an all in one unit like this AcuRite 01500 Wireless Weather Station with Wind and Rain Sensor might be just the ticket. It uses a range of instrumentation to provide you with your own personalized 12 to 24 hour weather condition forecast. This is especially useful for those of us that live in remote areas or places where weather forecasts are inaccurate due to a lack of weather instrumentation or those who live in microclimate zones that weather services don’t measure. This sophisticated weather station with cup anemometer can measure the temperature, the wind speed and direction, rainfall in inches or millimeters, and other data. And it distills it all down to a forecast summary that can tell you if bad weather is on the way, as well as give you a “feels like” temperature. The AcuRite Wireless Weather Station mounts on the side of a building such as a house and streams data to its included display up to 330 feet away (100 meters). It also gives you information about the day’s high and low as well as how much rainfall you’ve had and the time. 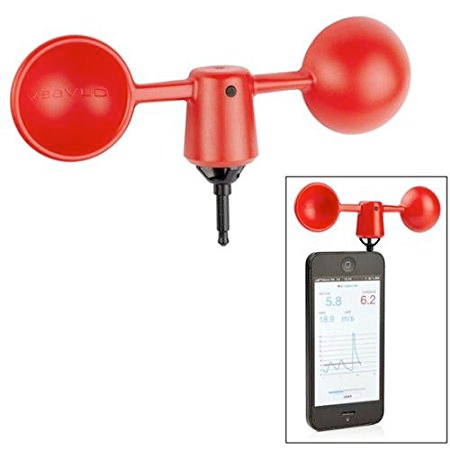 If you’re looking for a cheap cup anemometer with a digital readout, this handheld wind speed reader that plugs into your cell phone might fit the bill perfectly. It features a simple two-cup design and plugs into the headphone port of your iPhone, iPad or Android device. It works by plugging into the headphone port of your device, though if your newer cellphone doesn’t have a headphone port it will still work wirelessly as long as you hold it close and steady. It actually contains no electronics and works via batteries to communicate with your phone using the phone’s magnetic field detector (which is mainly only used for your phone’s compass). Works with Apple iPhone, iPad, Samsung Galaxy and virtually every other smartphone (see a long list of compatible devices here). One nice feature of this wind speed meter for smartphones is that it automatically logs your wind speed history along with location and time/date so you can easily refer back to it. That’s a great unique feature especially for portable anemometer uses like sailing, windsurfing, kitesurfing, etc. Looking to teach middle school high school students about climate science or weather? 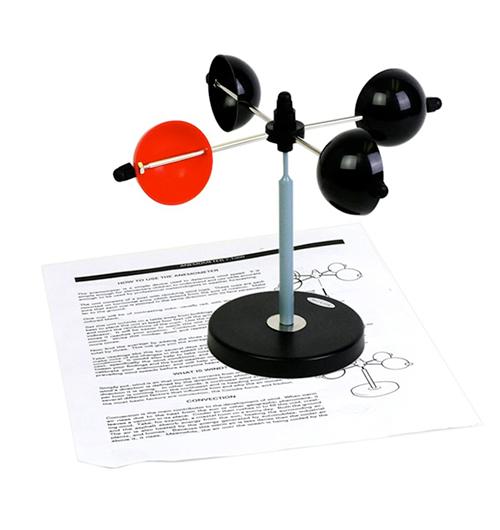 This educational wind cup anemometer helps teach basic concepts at an affordable price. The American Educational Products Cup Anemometer features four wind cups with two facing in each direction and one of them red which makes counting manual each revolution easy for students to do. This wind meter is easy to assemble and is made of non-corrosive elements meaning it can be left outdoors for long periods of time if desired. What is a cup anemometer? Cup anemometer definition: Anemometers measure wind speed, and a cup anemometer is specific type of wind speed gauge that measures the speed of wind or air flow based on how quickly a set of cups turns around in a circle. Cup anemometers are one of the older types of anemometers or wind meters and they’re they’re still popular today among weather hobbyists and professionals measuring wind and weather. Cup anemometers are generally pretty accurate and they come in a few different varieties with the major difference being how many different cups they have (two, three or four) and whether or not they electronically count the revolutions per minute or whether you need to count them manually to measure wind speed. The cup anemometers that are manual and do not automatically count revolutions are generally meant for student use and not professional use. Often the manual count anemometers will have one cup that is a different color to help make it easier to count the number of revolutions the wind cups make per minute. Cup anemometers will also sometimes come as part of a larger weather station with additional instruments. They also come in different form factors: some are designed to be mounted on the outside of buildings, others work well on top of a car, and still others are meant for handheld portable use. Common wind cup anemometer users: home weather hobbyists, storm chasers/storm spotters, HVAC contractors, wind power professionals, windsurfers, sailboat owners. Learn more about the different types of wind meters in our other article, what is an anemometer and what is it used for? How does a cup anemometer work? As the wind is caught in each cup on a wind cup anemometer, it pushes the cup to rotate and catches the next cup in its path, making the cup spin. The number of revolutions per minute will determine how fast or strong the wind is blowing. Some wind cup meters require you to manually count the revolutions per minute to discover the wind speed; other wind cup speed meters will measure the wind speed digitally and calculate it for you by counting the rotations on an internal computer. 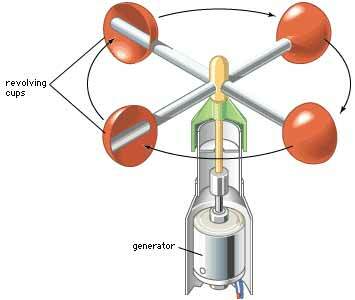 A wind cup anemometer is a relatively basic but still fairly accurate wind instrument from a scientific point of view. They are in common use at weather stations around the world and points of interest where wind velocity is extremely important to understand such as airports. They are also used by wind power professionals who are evaluating sites for potential turbine installation. Does this cup anemometer have a digital readout or will I need to manually count revolutions? This is a pretty obvious question and in most cases most people will require an anemometer with a wind calculator built in. One exception may be science teachers or those looking for a weather related gift for a child. Is this cup anemometer handheld or mount-able? Some cup wind meters are meant to be mounted on cars or buildings or poles, and others can be brought with you wherever you go. Does this mountable anemometer have a wired or wireless display? If you’re looking to use an anemometer mounted on your vehicle or outside of your home you may be especially interested in getting a wireless anemometer with a decent range to it so you can measure the wind speed without having to have a cable hooked to your device outdoors. 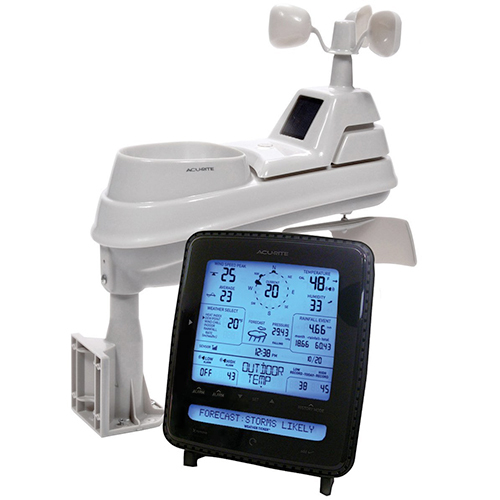 Some rotating cup anemometers have wireless displays that can be placed hundreds of feet away and others require a cable to go from the wind cups to the display indoors. Regardless of whether or not your anemometer is wired or wireless, you’ll want to check the maximum range or cable length of the display you’re considering. How many cups does this anemometer have? Cup anemometers come with a variety of different cup counts: some are 2 cup anemometers, others are 3 cup anemometers and still others have 4 cups. Do I want a cup type anemometer that has logging built in? If you’re interested in logging wind velocity, you may be particularly interested in a cup anemometer which works with your smartphone so the wind speeds you measure can be logged with time and location. Do I only care about measuring wind speed or do I want other features and functions too? If you’re interested in more than just wind velocity, you may want to consider fully fledged personal weather stations that include wind cups but also measure factors like temperature, barometric pressure, rainfall, humidity and other factors. These personal weather stations can accurately predict rain and weather conditions using a variety of instruments and often come with wireless digital displays that you can keep in your home.